Home / News / Trending / Rights advocate calls viral photo of critics of anti-tambay "Kabobohan"
Rights advocate calls viral photo of critics of anti-tambay "Kabobohan"
Migrant workers' rights advocate and former overseas Filipino worker (OFW) in Saudi Arabia Frank Resma, lambasted a viral photo of critics of the Anti-tambay order of President Rodrigo Duterte, and called their protest "kabobohan". "PASIKATIN NATIN ANG KABOBOHAN NG MGA NASA PICTURE NA ITO!" 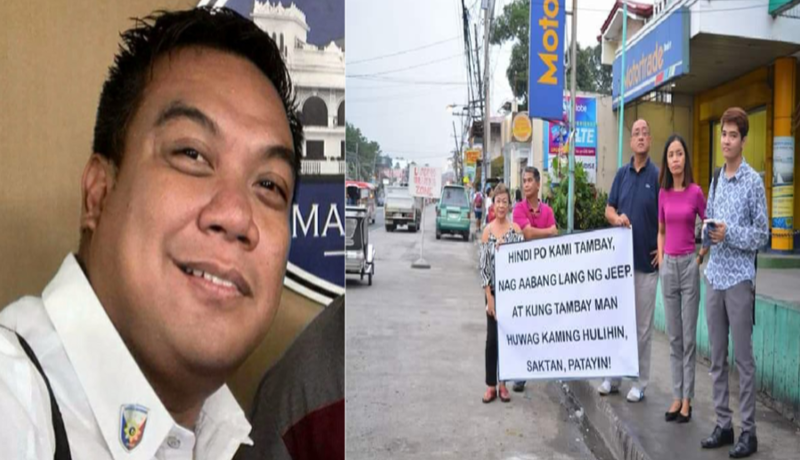 Resma was talking about the viral photo where five citizens are seen by the streetside, holding a sign where these words are written, "Hindi po kami tambay, nagaabang lang ng jeep, at kung tambay man huwag kaming hulihin, saktan, patayin!" The protest was targetting the anti-Tambay order, which began earlier this month when President Rodrigo Duterte told the Philippine National Police to apprehend loiterers in public places. Resma said that looking at the pictures, he felt the need to correct the statement. "ARE YOU A POTENTIAL THREAT TO THE PUBLIC? WHAT A STATEMENT! NEEDS TO BE CORRECTED, MALINAW NA MALI ANG PAG-INTINDI NYO!" A number of people on social media has criticized the police order, deeming it anti-poor for targetting the less priveleged when the government could offer bigger solutions to poverty and not attack its effects. "DONT YOU GET IT? THE AUTHORITIES WANTS A SAFER PLACE FOR ALL SANS THE CRIMINAL ELEMENTS LOITERING OUR STREETS! WAG SANA MANGYARI NA MAY MABIBIKTIMA NA MAHAL NYO SA BUHAY TO CHANGE UR PERSPECTIVE!," he said. Meanwhile, Duterte denies that he wanted the loiterers arrested. In a later statement, he said he wanted teenagers rounded up "for their own protection".